You can stop reading here if you don’t need to know how I got to and from the Springsteen concert that New Year’s Eve. This is a story filled with some puffery and horn tooting on my part. The writer, who was the person I went to the first concert with, had a friend in Boston, who would visit him often to take in a movie, a Broadway matinee, another movie, and then another play, all in one day. One day the writer calls me into his office where he is on a conference call with his friend from Boston and a young scalper named Evan. I take the phone and Evan tells me that he has two seats passed midway back on the floor, but he also has an extra seat next to him third row center, and would I be interested? I said of course, and then Evan told me how the last girl he took to a concert turned out to be a real CT, and was continuing until I stopped him and stated “Why are you telling me this Evan.” The guys were mortified. I think the idiots actually thought Evan was merely looking for a date to the concert, and gave me no warning when I was handed the phone. 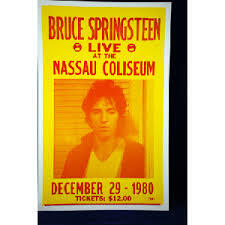 So, New Year’s Eve I drove the writer’s car that was black and seemed to impress everyone though I had and still have no idea what it was, to Nassau Coliseum with his friend from Boston to sit much further back than the third row. It was another great show, and ringing in the new year with Bruce was just swell. But afterward the traffic getting out of the Coliseum was more than I wanted to put up with. It was hard enough just getting out of the parking space, so I took off my glasses, which I only used and always used for driving, told Boston to look the other way, and flirted my way out of the huge lot. That’s right, I did that, although I think the car may have helped. I didn’t cut in front of anyone, I just politely motioned for permission and got us out of there in a relatively short period of time. Don’t judge me. I surely couldn’t do that today. Check out the poster. $12 a seat.